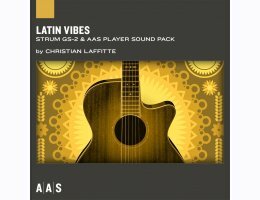 Applied Acoustics Systems releases the Latin Vibes sound pack for the Strum GS-2 and AAS Player plug-ins in collaboration with sound designer Christian Laffitte. Latin Vibes is the second of a new and growing line of sound packs for Strum GS-2. Christian Laffitte is a French musician and sound designer based in the south of France. He has been developing sounds for Dream, Arturia, Zoom, Applied Acoustics Systems, M-Audio, Avid to name a few. He also composed music for Sony video games trailers and music for French TV channels and radio stations. As a keyboard player with a great interest in synthesis and new technologies, Christian Laffitte has put all his passion for music and sounds in creating Wejaam: a free music sequencer for smartphones and tablets. Latin Vibes is compatible with Strum GS-2 (requirements below), and AAS Player.